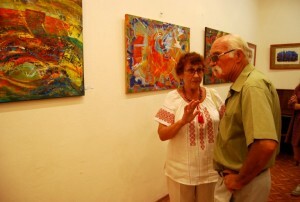 The Art Gallery at Petro Mohyla Black Sea National University receives visitors again. 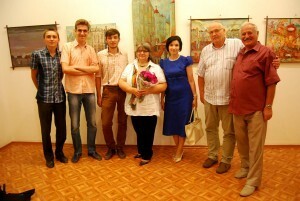 This time, these are artists from Lviv, Kateryna and Volodymyr Nemyra, who came to the south with an exhibition “Image Harmony”. It’s true that the couple lives in harmony with the world and with each other for many years already. They’ve succeeded to unite creativity and completely present it to others. Not only forms, but also feelings and signs are depicted on the pictures. 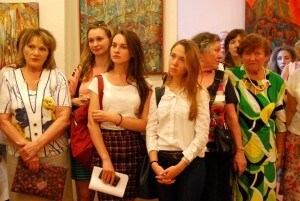 The first vice-rector, Oleksandr Trunov welcomed these artists, and thanked for such an opportunity to see the world from the point of view of another person. Nemyras travel a lot. Almost for 16 years they have lived in the USA. The artists live together amicably and help each other giving pieces of advice or making kind jokes. The Director of the Institute of Philology, Oleksandr Pronkevych, has personally expressed his admiration, because, to his mind, Ukrainian art should be like that. Volodymyr and Kateryna Nemyra have told us about the impression they have created in their mind about Mykolaiv and our university. 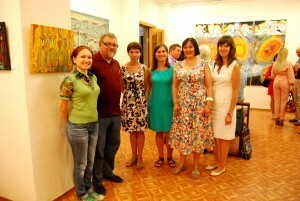 Also they were very thankful to all the people who came to observe their art. The couple is confident that we should live not for wealth, but for new impressions and feelings, which later can be put on the canvas.